Department Gastroenterology LTMMC & LTMGH, Sion, Mumbai. We report a case of pancreatic adenocarcinoma with cystic changes which masqueraded as pancreatic pseudocyst with liver abscess. A 46 years old male patient presented to us with complains of pain in abdomen, fever and weight loss of 5Kgs and anorexia over 40 days. Abdominal pain was boring, predominantly in epigastric region, intermittent and was radiating to back. Abdominal pain was associated with intermittent spikes of high grade fever with chills and rigors. The patient also noticed an abdominal swelling in the epigastric region which was painless but was tender on examination. Abdominal system examination revealed presence of intra-abdominal retroperitoneal lump in epigastric region around 4x4 cm sized with variable but predominantly cystic consistency. Also there was presence of hepatomegaly of 2 cm below costal margin which was non tender, smooth surface, firm in consistency and normal margins without any splenomegaly or evidence of free fluid. His blood examination revealed Hb 8.5 Gm%, platelets 230000, total count 5600 cell/cmm, creatinine 0.9mg/dl, serum amylase 48 mg/dl, INR 1.06, AST 49 IU/L and ALT 24IU/L. Ultrasound examination showed presence of 6.9x5.3x6 cm heterogeneously hyper echoic lesion in segment 4a with perilesional edema in liver and multiple cystic lesion in body and tail region of pancreas largest measuring 6.2x7.8x9 cm lesion in the tail reaching upto splenic hilum. Patient was started on IV antibiotics and IV fluids. CT scan also showed similar findings suggestive of liver abscess in with multiple pancreatic pseudocyst and dilated main pancreatic duct. 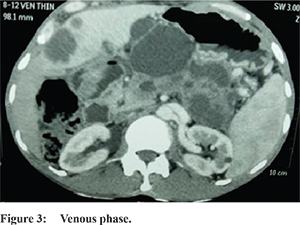 (Figure 1,2,3) Despite antibiotics patient continued to have fever and abdominal pain. An ultrasound guided attempt to aspirate liver abscess content was unsuccessful because of solid component. Hence multiple biopsies of the solid lesion were taken. Biopsy report was suggestive of large rounded pleomorphic cells with vesicular nuclei and scanty cytoplasmdesmoplastic reaction in background suggestive of high grade malignant epithelial tumor. Immunohistochemistry came positive for CK 7 and CK 20 suggestive of malignancy of biliary or pancreatic origin. His OGD, colonoscopy and CT thorax were normal. His Ca19-9 was 21671 u/ml,CEA 134 ng/ml and AFP was 1.75 ng/ml. Endoscopic ultrasound was performed and revealed the presence of hypodense mass in region of neck pancreas with cystic component and presence of multiple cystic lesion with internal debris in body and tail region of pancreas. EUS guided biopsy of neck region revealed presence of adenocarcinoma in neck region with cystic change. EUS guided cyst fluid examination revealed cyst fluid amylase - 8 u/l cyst fluid CEA ->1500 ng/ml. So diagnosis of pancreatic adenocarcinoma with cystic change and liver metastasis was kept. Patient was inoperable due to presence of liver metastasis and was deemed unfit for chemotherapy because of his general condition. Pancreatic adenocarcinoma is usually a solid tumour.1 However in one large series 8% patients with adenocarcinoma showed cystic changes.2 Pancreatic adenocarcinoma with cystic change may be of various types. Most common of all is adenocarcinoma showing pseudocystic changes.3 Other changes are large duct type which is due to marked ectasia of neoplastic gland, retention cyst and intratumoral degeneration are the other types of change.2,3 Our patient had pseudocystic type of changes which is most common change overall with pancreatic adenocarcinoma. However in series of 38 patients Kosmahl et al foundl arge duct type as most common change followed by intratumoral degeneration.2 Various immunohistochemistry markers may help to distinguished between malignant and benign etiology. Adenocarcinoma is frequently positive for MUC1 and CEA.4 Benign aetiologies are negative for this markers. Immunohistochemistry may also help to distinguish between various malignant cystic lesions. IPMN main duct type is usually positive for MUC2 and branched duct is positive for MUC5AC.5 Cyst fluid may show presence of high values of CEA. Kloppel G, Hruban RH, Longnecker DS, et al. Ductaladenocarcinoma of the pancreas In: Hamilton SR, Aaltonen LA (eds). Pathology and Genetics of Tumours of the Digestive System. WHO Classification of Tumours. IARC Press: Lyon. 2000, pp 221-230. Kosmahl M, Pauser U, Anlauf M, Kloppel G. Pancreatic ductal adenocarcinomas with cystic features: neither rare nor uniform. Modern Pathology. 2005;18:1157-1164. Lee LY, Hsu HL, Chen HM, et al. Ductal adenocarcinoma of the pancreas with huge cystic degeneration: a lesion to be distinguished from pseudocyst and mucinous cystadenocarcinoma. Int J Surg Pathol. 2003;11:235-239. Batge B, Bosslet K, Sedlacek HH, et al. Monoclonalantibodies against CEA-related components discriminate between pancreatic duct type carcinomas and nonneoplastic duct lesions as well as nonduct type neoplasias. Virchows Arch [A] Pathol Anat. 1986;408:361-374. Luttges J, Zamboni G, Longnecker D, et al. The immunohistochemical mucin expression pattern distinguishes different types of intraductal papillary mucinous neoplasms of the pancreas and determines their relationship to mucinous noncystic carcinoma and ductal adenocarcinoma. Am J Surg Pathol. 2001;25:942-948.